At least three weekday mornings plus Saturdays, year-round, Virginia Watson is outside on one of Mecklenburg County’s greenways, walking at least 20 miles with a buddy, enjoying the scenery, the sounds of nearby creeks and a sense of community with other walkers. Watson’s fondness for greenways is widespread in Mecklenburg and elsewhere across the country, where residents increasingly are flocking to these linear parks to walk, run or bike. 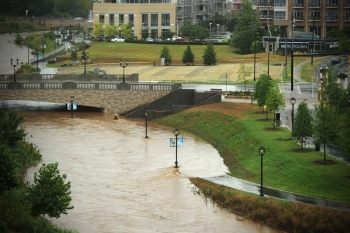 The signature Little Sugar Creek Greenway – a portion of which meanders near uptown Charlotte offering both skyline and nature views – attracts hundreds to festivals, races and other community activities. A few greenways are so popular on weekends that parking spaces near main entrances are a hot commodity. Today, the greenways are closely linked in many residents’ minds with the county’s various creeks. But more than 30 years ago, many Mecklenburg residents couldn’t imagine the role of greenways in providing open space or their contribution to the preservation of creeks and wetlands and to improved water quality. Some homeowners complained about strangers being too close to their backyards or a possible increase in crime. Dairy farmers worried greenways near their pastures would scare the cows. 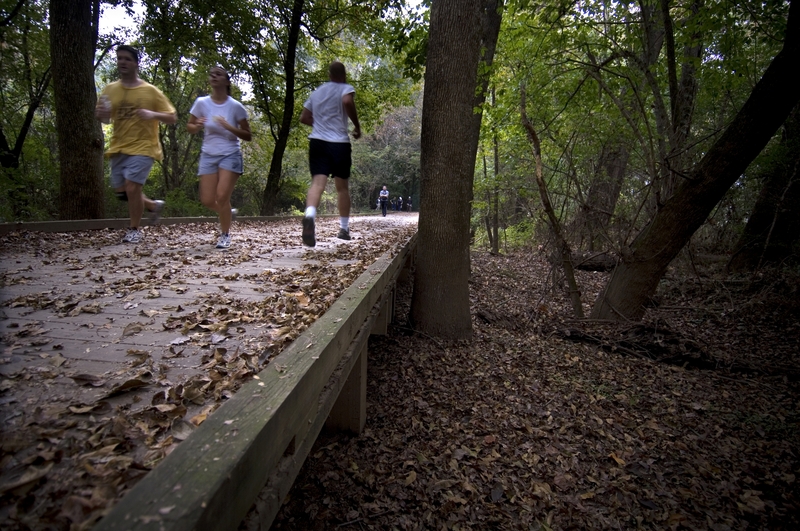 Now stretching 40 miles, Mecklenburg’s paved and gravel greenways offer not only recreation and transportation opportunities, but act as natural buffers to help reduce the impact of flooding, improve water quality and provide wildlife habitat. More than half of the greenway mileage, about 28 miles opened for public use in the last decade. Near uptown Charlotte, a portion of the Little Sugar Creek Greenway has been a magnet for restaurants and businesses. Subdivision developers, eager to tout a greenway as a neighborhood amenity, today willingly donate property to build them or advertise the proximity of existing paths to potential buyers. In a recent county survey, residents ranked greenways as a top priority for local recreation, reflecting a societal shift toward activities promoting health and wellness. The county’s ambitious greenway plan calls for building a 203-mile linked “green necklace” that will allow residents to travel, primarily along creeks, from the towns of Davidson, Cornelius and Huntersville in north Mecklenburg through Charlotte to Pineville, Matthews and Mint Hill in the south. 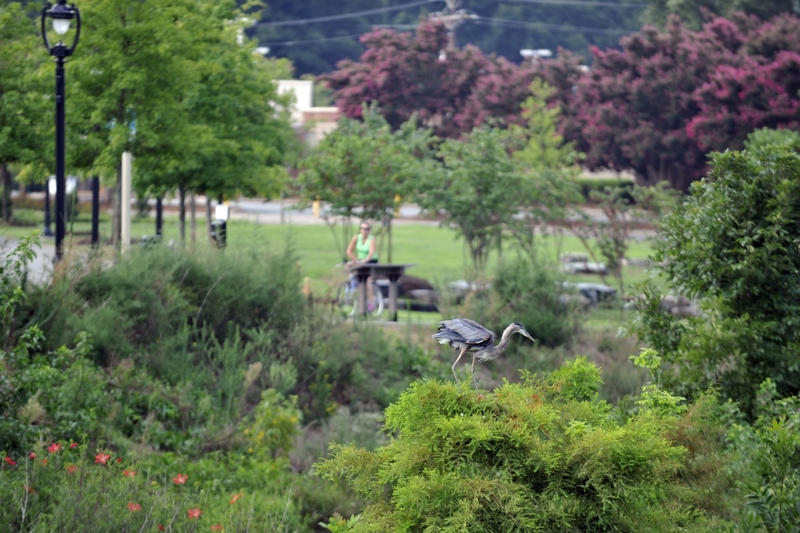 Parks officials estimate at least $40 million has been spent to buy property and develop greenways in partnership with creek restoration projects. The goal, park officials say, is to open at least six miles of greenways annually. As the number of greenways has grown, a regional movement has emerged to provide a trail network connecting cities, towns and natural areas in 15 counties in North Carolina and South Carolina. The Carolina Thread Trail is planned to link an estimated 2.3 million people with 1,400 miles of trails, including some of Mecklenburg’s greenways. 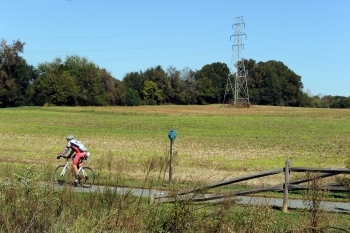 In Charlotte, officials are proposing a multi-use trail across the city to connect greenways. Last year, voters approved a bond referendum allocating $5 million to begin planning it. 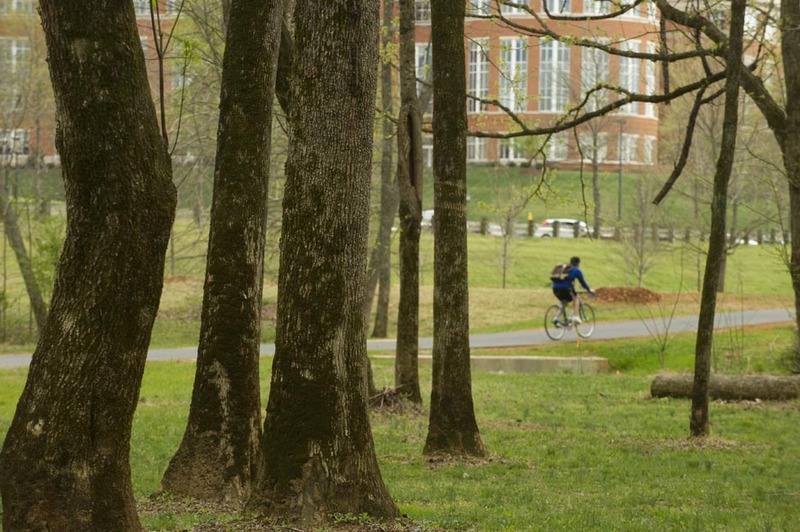 The greenways compete for funding in a growing county facing demands for a variety of recreation options, and work on the system slowed during the past five years, as the county wrestled with the financial impact of the Great Recession. 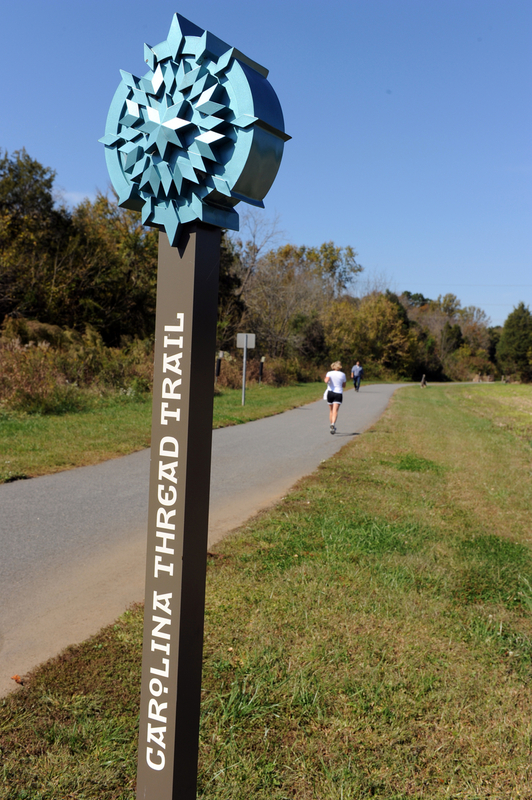 McAlpine Creek Greenway opened in 1979 as the county’s first, the culmination of 15 years of assembling land primarily with federal funds. While the idea for that greenway had surfaced in a 1965 plan, work on a countywide system along 20 creeks did not begin until 1980, when officials adopted a master plan based on the research of UNC Charlotte graduate geography student Joan Sigmon. It has been updated several times, most recently in 2008. Fountain Odom, Sr. – a former Mecklenburg County commissioner and state senator who began advocating for greenways as a member of the parks and recreation commission in the 1970s – remembers the early opposition as well as the effort by some officials, particularly former commissioner Liz Hair, for whom a part of a greenway is named, to rally public support. But the initial plans were halted in 1981 after residents in the Idlewild Farms neighborhood rejected a greenway along Campbell Creek and dairy farmers protested one proposed in north Mecklenburg. Officials later hired a public relations firm to sell the greenway story and win public support. The land used for greenways is generally off limits to development because of potential flooding. Officials estimate at least 60 percent of greenway property, both developed and undeveloped, has been donated by developers. The county currently owns an estimated 1,900 acres of undeveloped property along the creeks. In many ways, development of the greenway system has mirrored the county’s growth. Officials and planners during much of the 1980s focused on buying land, targeting areas of projected population growth. They decided to distribute greenways throughout the county rather than focusing on longer segments in a few neighborhoods. While some communities across the country adopted ordinances requiring mandatory donation of floodplain property during the development process, including Greensboro and Guilford County, that idea never gained traction in Mecklenburg. Other jurisdictions, including Wake County, Raleigh, Kannapolis, Lincolnton and Belmont, also require subdivision developers to either donate land or pay a fee for parks and recreation. Click image for zoomable view. 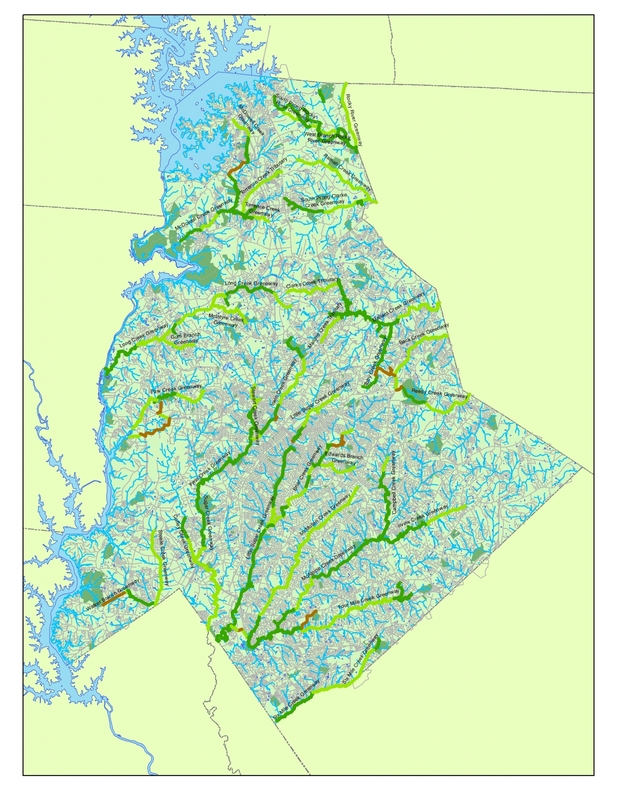 Greenways are in dark green; proposed greenways in light green; overland connectors in brown. Information from Mecklenburg County Park and Recreation Department. When it started, the greenway program was a county government initiative. In 1991, however, the Charlotte and Mecklenburg parks and recreation departments merged under county control during a larger consolidation of several city and county services. Funding for greenway land acquisition and construction then had to be weighed against the need for ball fields, recreation centers and parks. Voter-approved bond referendums in the 1990s and in 2004, with money designated for greenways, moved the county’s program from primarily land acquisition to construction and opening of paths. Nearly 28 miles have been completed since 2005, opening access to an increasing number of greenways, as more and more people seek to spend more time outdoors. At 40 miles, Mecklenburg’s greenway system isn’t the largest in North Carolina and is smaller than some in similar-sized cities across the country. Raleigh, for example, has more than 100 miles of greenways in a system started before Mecklenburg’s. Greensboro has 80 miles. Neither of those cities’ greenways focuses primarily on creeks and streams. As Mecklenburg’s program expands, it is becoming more expensive, according to Jones. Land costs are rising, as well as prices for asphalt and other materials used for the paths. The estimated cost of each greenway mile is increasing from about $1 million to between $1.5 and $1.7 million. The county’s 2014-18 capital improvement plan includes an additional 22 miles of greenways, either for buying property, designing or building. Whether all the projects are built depends on funding approval for each of those years by county commissioners. Nancy Brunnemer is proud of the steady development of greenways. She remembers when she walked along much of the creek side property after arranging for its purchase or donation, wearing boots and carrying a machete. As the first county greenway planner, she was on the front line of turning the plans into paths, and helping, she says, improve the county’s quality of life.